At long last, our book on The Archaeology of Western Sahara is out. The book details the results of eight seasons of fieldwork in the Polisario-controlled areas or ‘Free Zone’ of Western Sahara from 2002 to 2009. It describes the geographical and environmental contexts of the archaeology of Western Sahara, and the results of both extensive and intensive survey focusing on stone features/monuments. The extensive survey covered a vast area extending across the Northern and Southern Sectors of the Free Zone, and focused on identifying and recording sites of archaeological and environmental interest. Recording of archaeological sites during the extensive involved the opportunistic recording of stone features and rock art, and the detailed recording of stone features within specified small areas, in order to gain an understanding of the nature and diversity of these aspects of the archaeological record. Some environmental sites were sampled for analysis, although results were very limited due to the challenge of exporting materials from Western Sahara as a result of its status as a disputed, non-self governing territory. The intensive survey focused on a restricted area of several square kilometres just north of the settlement of Tifariti, in which all anthropogenic stone features were recorded. Two stone monuments were excavated, and a number of test pits were also excavated. The results of the excavations and surveys are interpreted in relation to the wider Saharan archaeological record, and to changes in the Saharan environment over the past 10,000 years. The book is available from Oxbow Books (price £55) and Amazon (price £53 in print or £33 as a Kindle edition). Nick Brooks is giving a short (30 minute) talk about Western Sahara and the work of the Western Sahara Project on Thursday 25 April at a lunchtime in the Sainsbury Centre for Visual Arts (scva.org.uk) at UEA, to accompany a small photographic exhibition on the work of the Western Sahara Project. The talk is informal and aimed at the public. Details of the talk are given below, and directions here. Climate, culture and colonisation in Western Sahara – the past 10,000 years. At the next SCVA lunchtime talk on Thursday 25 April, Dr Nick Brooks will talk about the archaeology of Western Sahara, and how it relates to changes in climate over the past 10,000 years, during which time the Sahara underwent a transition from humid Savannah to arid desert. Nick will talk about evidence for past environmental change in the Sahara, aspects of the archaeological record including rock art and ‘megalithic’ monuments, and how changes in climate and environment affected the way prehistoric people lived in the desert. He will also discuss the challenges of working in a conflict zone whose post-colonial status is still unresolved. The talk will draw on fieldwork conducted as part of the UEA’s Western Sahara Project, which Nick co-directs with Dr Joanne Clarke. The Western Sahara Project may have been keeping a low profile lately, but behind the scenes we’ve been working furiously to complete a book detailing the findings of Phase 1 of the Project, which consisted of eight seasons of fieldwork from 2002 to 2009. The book will have the undramatic title “The Prehistory of Western Sahara: A Synthesis of Fieldwork, 2002 to 2009” and will be published by Oxbow later this year (hopefully by November). A draft has been submitted to Oxbow and is currently with reviewers. The book will have eight chapters, which will address wider archaeological and environmental contexts, environmental survey work, reconnaissance or ‘extensive’ survey work throughout the Polisario-controlled areas or ‘Free Zone’, intensive survey work in a limited area north of Tifariti, and excavations in the intensively surveyed area. A chapter is dedicated to the chipped stone record, and another to the typology of built stone features (including but not limited to monumental funerary structures). The final discussion chapter places the archaeology of the Free Zone in its wider Sahara context, and discusses affinities with the Atlantic Europe interaction sphere. Currently we have no plans to return to the field in 2013, which will be spent producing some additional publications and sourcing funding for Phase 2 of the Project. We hope to return to the field in 2014, subject to the availability of funding. We will be contacting people who have expressed an interest in volunteering for fieldwork in due course, and will maintain a mailing list of those interested in participating in fieldwork, so that we can send out updates about any future field seasons. In the meantime, watch this space or find us on Facebook or Twitter for news about the Project. The Western Sahara Project photo collections on Flickr are currently being updated and reorganised. Photos are being organised so that images relating to specific themes, and specific archaeological features and sites, can be found more easily. 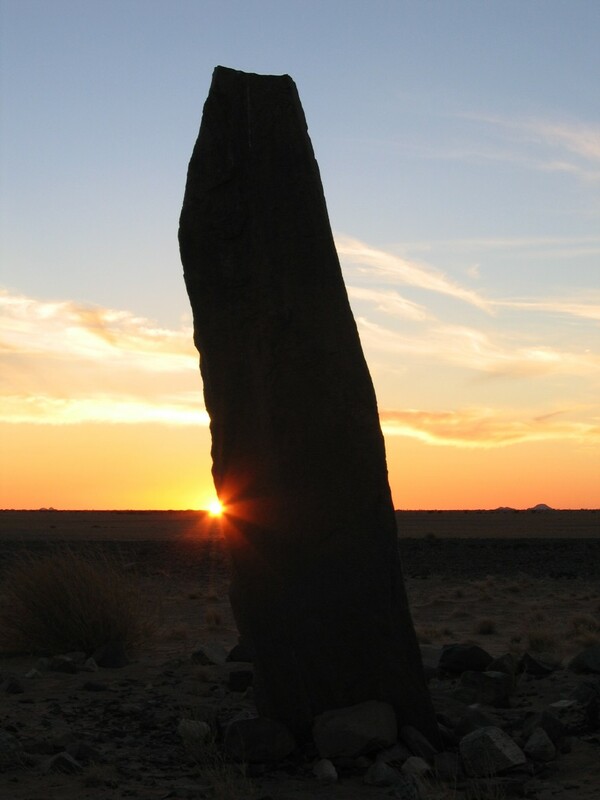 Standing stone near Azaig Bedgrag, feature AZ1-1. Southern Sector. You can now search categories such as “Archaeology“, “Contexts” and “Cultural Heritage“, and view photos organised by geographic region. Under each of these headings there are folders (or “collections”) that contain a number of photo sets relating to specific topics or survey sites. Under “Archaeology” there are folders containing containing photo sets for named archaeological features/sites in the Northern and Southern Sectors of the Free Zone. Eventually we will upload photo sets for every site or feature for which photos are available (most of them). This will take a little while, as we have nearly 600 features/sites in the database resulting from the “extensive” or reconnaissance survey work, and some 400 from the intensive survey work near Tifariti. However, once they are all there, anyone will be able to access high-resolution photos of any sites or features mentioned in our publications by searching for the relevant site/feature code. The “Archaeology” collection will also contain folders and photo sets organised by theme, so you can look at a collection containing all the images of chipped/worked stone, or all the examples of a particular type of stone monument (e.g. “crescent”, “goulet”, etc). The “Contexts” collection currently houses sets of photos relating to the political context (maps, refugee camps, the legacy of the conflict), contemporary social and cultural contexts (life in the desert, cultural events/festivals), and environmental contexts (landscapes, climate). The “Cultural Heritage” collection focuses on threats to the archaeological heritage (e.g. vandalism), and the preservation of heritage. If there is anything in which you are particularly interested, let us know and we can try and prioritise the uploading of the relevant photo sets if they are not already there (assuming we have what you are looking for!). This is the new website for the Western Sahara Project, run by Nick Brooks and Joanne Clarke from the University of East Anglia. Content is currently being migrated from the old website at http://www.nickbrooks.org/WS/WSahara.htm Please bear with us as we transfer material and update this new site in the brief gaps between other commitments.